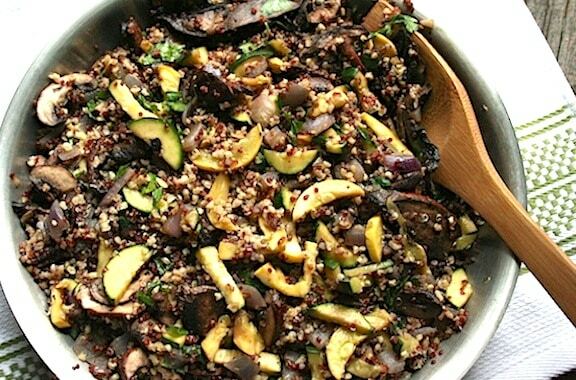 Earthy and hearty, this combination of quinoa, tender squashed and mushrooms can be served any time of year. Serve with Avocado and Pinto Bean Salad or a big colorful salad to which you add your favorite beans. and some stone-ground tortilla chips. Photos by Rachael Braun. Combine the quinoa and bouillon cube with 2 cups water in a medium saucepan and bring to a gentle boil. Lower the heat and simmer gently until the water is absorbed, about 15 minutes. If you’d like a more tender grain, add another 1/2 cup water and cook until absorbed. Heat the oil in a skillet or stir-fry pan. Add the onion and garlic and sauté over medium heat until translucent. Add the wine, squashes, mushrooms, and optional chili peppers, and sauté over medium-high heat until the squashes are touched with golden spots. Stir in the cooked quinoa, followed by the parsley, oregano, and cumin. Cook over low heat, stirring frequently, for 3 to 5 minutes longer. Serve at once. 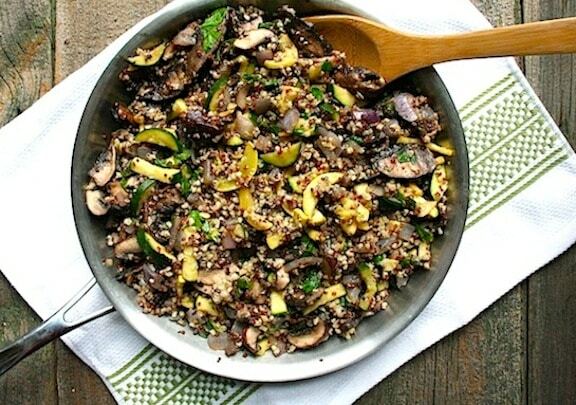 I made something very similar to this… Quinoa, mushrooms, squash and onion with garlic, cumin, chili powder, oregano and a little bit of salt and pepper. It was delicious! Glad I found this recipe!